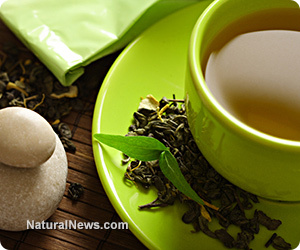 (NaturalNews) Is it possible that the simple act of drinking green tea can help protect your brain against Parkinson's and Alzheimer's disease? A multitude of studies have looked into the effects that the tea has on neurological health -- and the results are promising. A degenerative disorder that progressively attacks the central nervous system, Parkinson's disease eventually results from the loss of dopamine-producing cells in the brain. Currently, there is no cure. As reported by ScienceDaily, a study published in Biological Psychiatry (Elsevier) explored a possible treatment for the disease using green tea. Lead researcher Dr. Baolu Zhao and his team discovered that "green tea polyphenols protect dopamine neurons that increases with the amount consumed." Additionally, "[t]hey also show that this protective effect is mediated by inhibition of the ROS-NO pathway, a pathway that may contribute to cell death in Parkinson's." Interestingly, green tea protects the brain from the damaging effects of not only Parkinson's but Alzheimer's disease as well. "Swiss researchers used functional magnetic resonance imaging (fMRI) to watch the brains of 12 healthy volunteers as they performed tasks testing 'working memory.' This type of memory allows the brain to simultaneously store and process information; it's important to such complex cognitive tasks as language comprehension, learning and reasoning. Participants' brains were scanned after the subjects had consumed two different doses of a beverage containing green-tea extract, as well as a placebo drink." The researchers found that, compared to the placebo group, those who consumed the green tea extract had heightened activity in the dorsolateral prefrontal cortex, which is the part of the brain associated with working memory processing. Higher doses of the extract were shown to proportionally increase activity. Another study, published in Molecular Nutrition & Food Research, tested lab mice for the brain effects of epigallocatechin gallate (EGCG) in green tea. The team observed that treatment with EGCG "significantly increased the number of cells associated with neuro-genesis," states the health and nutrition newsletter. That is, after an injection of EGCG, the performance of the mice navigating a maze substantially improved -- an indicator of increased spatial cognition. Likewise, two additional studies also demonstrated the role that green tea plays in mitigating Alzheimer's disease. British scientists formed amyloid proteins that were similar to the sticky, toxic plague that attaches to the brain nerve cells of Alzheimer's patients. When the researchers added green tea and red wine extracts to the proteins, both caused the plaque to alter its shape, rendering it unable to properly attach to nerve endings. Similarly, a multidisciplinary research team at the University of Michigan discovered that "EGCG extract also actually broke down existing aggregates in proteins that [contained] metals--copper, iron and zinc--associated with Alzheimer's disease," reports Tufts University.